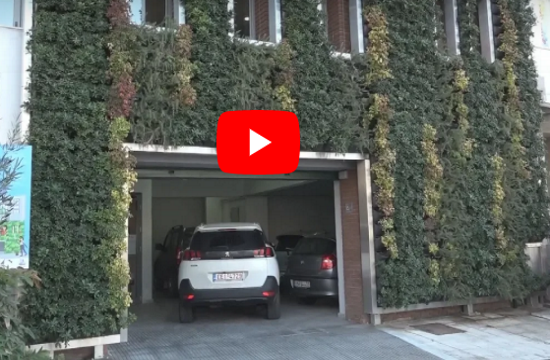 The facade of the Urban Environment Directorate building on Kleanthous Street in the northern Greek city of Thessaloniki has been converted into Greece's first vertical garden, covering an area of 50 square metres, ANA reports. This space has been planted with 804 potted plants, containing four species of plants that are well adapted to the local climate and conditions. The initiative was carried out by the Thessaloniki municipality in cooperation with the Global Water Partnership Mediterranean and the Coca Cola Greece environmental programme. This was only one of several municipal projects to save water, such as the systems installed in the nearby municipal swimming pool in Toumba, to reduce wastage of hot water in the showers and toilets that helped reduce consumption of water and energy by 20-30 pct. Talking about the goals of Global Water Partnership Mediterranean in Greece, the head of the programme Konstantina Toli said that the goal was to revive techniques for the collection of non-drinking water, which accounted for 90 pct of household water use. She said such systems had been restored or installed on several Greek islands, such as the 2,600 cisterns on Folegandros, or systems to collect rainwater on Syros.